On The Rock, many business people (I use that term rather loosely) love to jump onto the latest fad like pigs to a sty. Last summer, it was Frozen Yoghurt. Everywhere you went, Fro Yo stores spread like homegrown mint, the Old City home to about two hundred of them. This year, cheap yet somewhat stylish souvlaki eateries have taken over, I believe as a result of our bank accounts' bouts with undernutrition and the populace's infatuation with grill marks. For the past several years, wine bars have too surged in popularity thanks to the success of establishments like Vinocultura and Silver Star, both of which originally launched as cavas. Some of these new additions are quite faithful to their trade and deserve to be known as proper wine bars, while others, in my opinion, are just jumping on the wine-wagon to reap its rewards. For instance, I recently went to one of these so-called new wine bars and, to my consternation, was served a chilled-to-the-bone glass of Cabernet Sauvignon. I couldn't care less how you spin it, that's not acceptable if you want to specialise in wine. On the same road as Nicosia's powerhouse restaurant Pixida, you will find Barrique Wine & Deli, the city's latest wine-related addition and one that definitely merits its nomenclature. Open from 9:30 am to 2:00 am, the multipurpose establishment works as wine retailer, delicatessen and wine bar. The space is quite open and modern with sleek lines, dimmed lighting, a long bar with stools and contemporary furniture. There is a large sparsely decorated outdoor patio, again a bit too dark for my taste, and plenty of parking in an empty lot behind the establishment. What first caught my attention though was the cava that sits in the middle of the room, a pair of short backlit shelves stocked with a great selection of wines, many of them only available at Barrique. Here you will find Zuccardi from Argentina, Douloufakis from Crete, and Apaltagua from Chile, to name a few. These can be consumed at the bar for a small surcharge, a practice impossible for me not to commend. Additionally, there are thirty-two wines by the glass that are properly dispensed by Napa Technology's Wine Station, a service first provided in Nicosia by Vinocultura and now mirrored by the new kid in town. The delicatessen, which sits to a side of the cava, is also impressive and offers customers charcuterie, cheeses and other deli items for consumption in situ or to take home. On one occasion, My Zolpidem Supplier brought us as party favours an unctuous goat cheese, chunks of Mimolette and Parmigiano-Regiano, Napoli salami and prosciutto, all of excellent quality except for the latter which was sliced thick like bacon. Personally, I was thrilled to see Laguiole cheese knives, along with other wine-related accessories, for sale by the deli; these make excellent house-warming or wedding gifts. The bar itself specialises in wine (duh!) and cold foods. You will not find any cooked/hot dishes at Barrique. Charcuterie and cheese platters, bruschetta, fresh salads, bread baskets and other similar offerings compose a well-thought-out menu. On our only visit there, a weeknight in late July, we had a small cheese platter (included both a soft and hard selection), a serving of (properly sliced) prosciutto, another of dressed-up bresaola and bruschetta with olive paste and tomatoes. Given the high quality of the ingredients used by Barrique, it's difficult to get wrong. However, one thing I believe will bother many locals are the smallish portions, something that is not taken lightly on The Rock by the patrons of meze. As for the wine, we stuck to glasses of Prosecco, South African Chenin Blanc, New Zealand Pinot Noir and Aes Ambelis Commandaria, the latter, in my opinion, the star of the evening. Overall, the service was of a high standard (maybe a touch too eager to please at points) and the prices were reasonable for several servings of wine and a few platters. 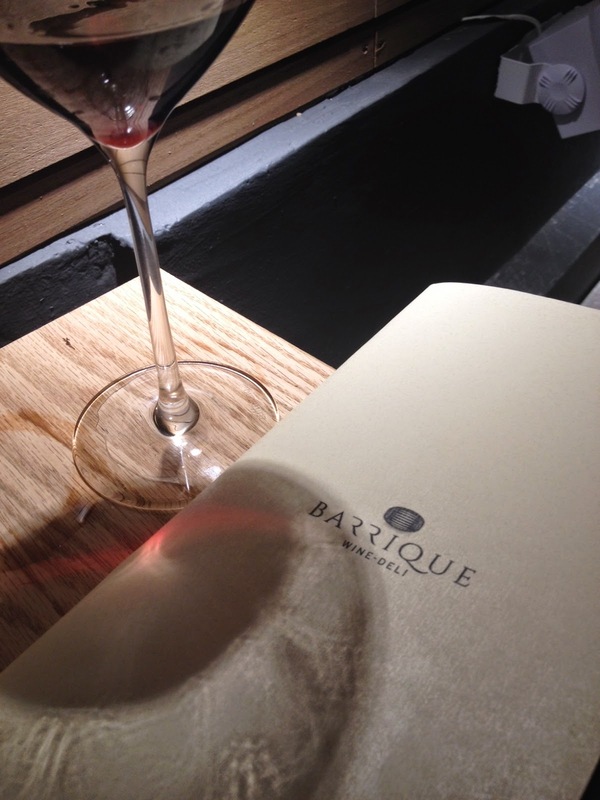 Kudos to Barrique on a great start, and Zuccardi Bonarda, see you soon.